Fall is an excellent time to plant onions for a great harvest next summer! Fall onions grow much like a crop of garlic, becoming well established in the cool fall temperatures before going dormant for the winter. When Spring arrives – they come back to life, using the previous year’s head start to take off strong! Although we plant onion crops in both the spring and fall – our fall crop always seem to bring a much larger and better tasting onion than our same-year planted onions. Fall planted onions also mature earlier, and can usually be harvested full size as early as mid June. Onions, grow best in loose, fertile soil, so working in a little compost to your rows is always a good idea before planting. If your soil leans to the clay side of the spectrum, add in a few shovels of sand to help loosen hard dirt. You can plant onions with seed or in bulb sets. We have always been partial to the sets, simply because they are easier to handle. Onions seeds are tiny, and can take a long time to become established. 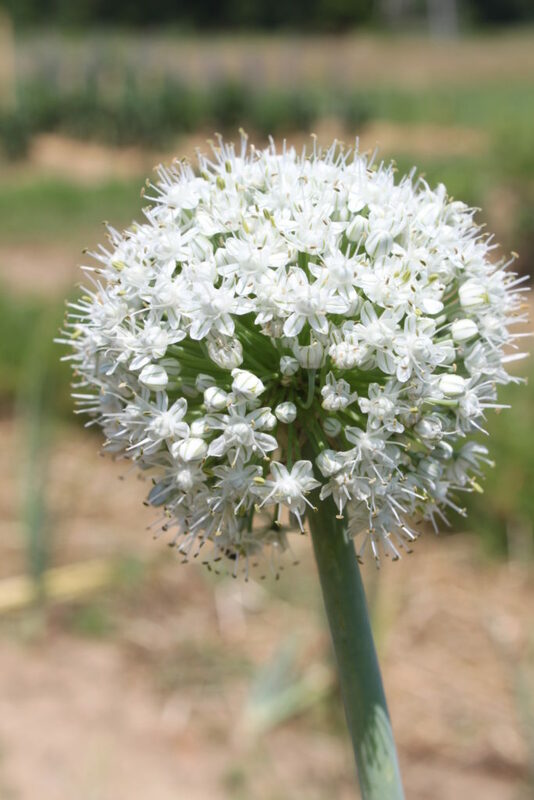 Onions can be planted around the same time as a crop of garlic. For us here in the Ohio – that means usually the first two to three weeks of September. Wherever you live, make sure your crop has a good 4 to 6 week window to become established before hard freezes become a regular event. 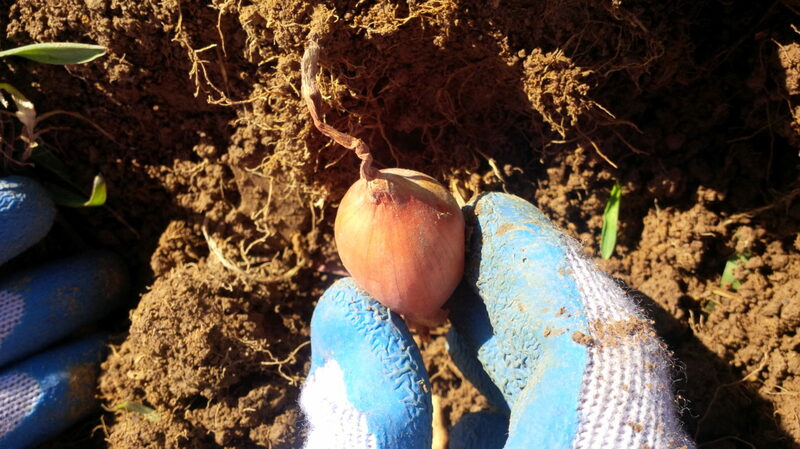 For onion bulbs, we dig a trench in the soil about an inch or two deep to loosen the dirt for good growth. We then fill back in the soil so that the planting row is about 1/4 to 1/2 inch deep. Next, we plant the bulbs with the point end up, and cover with soil. We like to space our crop bulbs about every 4″ to 6″ to allow plenty of room for growth. Once covered, mulch with a 1/2″ layer of straw or shredded leaves to keep out weeds and keep in moisture. If planting seed, you can actually plant a few weeks earlier, about 1/4″ into the soil. 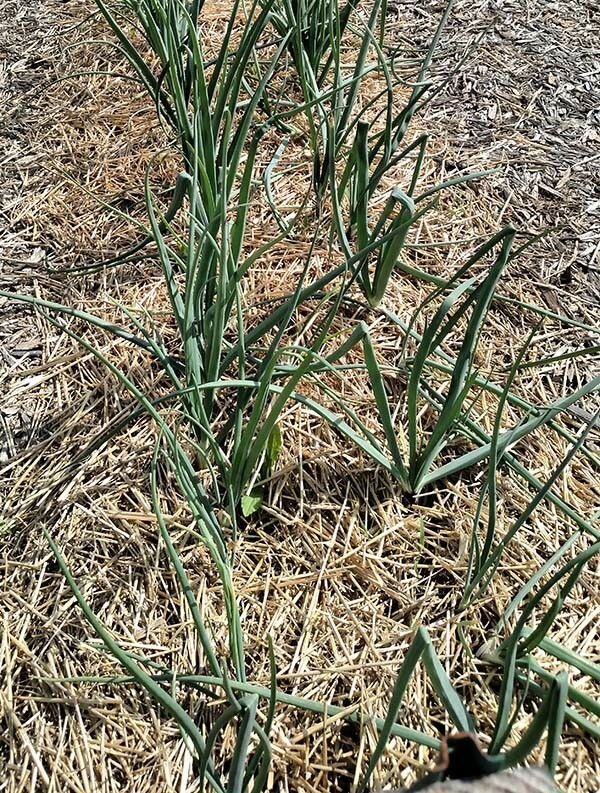 Much like a crop of fall planted garlic, it is important to give your onions a heavier mulching before winter. Once the onions have grown through the surface, add a few more inches of straw or shredded leaves. This will help blanket the crop for the long dormant wintertime ahead. Usually fall provides enough rain for the onions to become established. If you do however experience long periods of dry weather lasting a week or more – you can water the crop as needed. As for varieties, we have had the best success with mild flavored yellow onion sets and red onions. Leeks and shallots are also excellent choices as well. ← Zesty Pepper Soup Recipe – Enjoy Stuffed Pepper Taste In A Soup! I plant garlic every fall but had never considered planting onions in the fall. I assumed they would not withstand the winter since I had never heard of this. I may give it a shot this year while I’m out planting the garlic! I can’t seem to find anyplace online that has sets available in the fall. My local garden centers don’t have any either, they are basically closing out their gardening items, if they haven’t done so earlier in the summer. Is there a particular online company you can suggest? You can find them on-line or at most home and garden stores or greenhouses. Where do you get onion sets for fall planting? Thanks. Will onions and garlic get into your lawn? I’ve been reading your info on cover crops. Do the cover crops get planted on top of the onion sets?